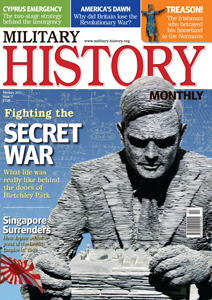 The February 2012 issue of Military History Monthly, the British Military History magazine, is on sale today. as a code-breaker, and we lift the lid on the secret world of spooks and ciphers. What did the British Army learn from its disastrous encounter with American rebels in the wooded wilderness of the Hudson Valley? Colonel Ronnie McCrum takes a critical look at a battle that was lost before the war began. Military historian Jeffrey James discovers the deep roots of Britain’s ‘Irish Problem’ – in the Norman conquest launched a century after the Battle of Hastings. Regular MHM contributor David Sloggett analyses the Greek-Cypriot War of Liberation.